AFCM encourages young musicians and builds future audiences for classical music in San Diego through support of music education and appreciation. Our more than 30 trained docents prep classes before they attend San Diego Symphony or Classics 4 Kids concerts. They play recorded previews and provide basic information about composers, instruments and musical elements such as melody, rhythm and timbre. Conductors tell us that students appreciate and enjoy concerts more if they've had a docent visit beforehand. When young students get a chance to hear classical music, they love it! As you'll see in this video. We've also awarded young competition winners. 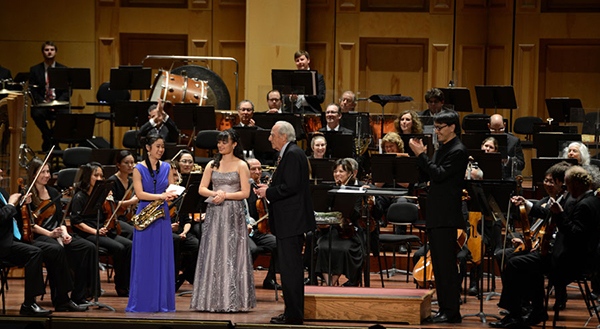 Here saxophonist Yenny Zhang and violinist Annell Gregory, winners of a San Diego Symphony Concerto Competition, receive $1000 each from AFCM President Ron Bierman. Conductor Ken-David Masur applauds their achievement. (Photo by Ling Zhu.) Ron chairs the AFCM Board. Annelle has gone on to win other competitions and recently recorded a well-received Rachmaninoff CD for Bridge Records. The Association of California Symphony Orchestras has awarded our organization a "Most Valuable Player" certificate. Take a look here. Every year we introduce over 10,000 youngsters to the pleasure and excitement of classical music--thanks to the support of over 200 members. Email AFCM@AdvocatesForClassicalMusic.org if you have comments or would like more information about our organization and volunteer opportunities.